On November 16, 2018, attorneys at Chapman partnered with attorneys and legal professionals from BMO Financial Group (through their Pro Bono program) to draft renewal paperwork for individuals whose Deferred Action for Childhood Arrivals (“DACA”) was up for renewal. DACA, which was instituted under President Obama as a temporary immigration status for young people who are without other lawful immigration status and meet certain eligibility criteria, has provided thousands of young people with the opportunity to lawfully stay and work in the United States. Because the Supreme Court is expected to take up the issue of DACA soon, there is a great need for affected individuals to renew status quickly. Led by and supervised by an attorney from the National Immigrant Justice Center, Chapman and BMO volunteers were able to help fourteen young people (twice as many as an ordinary clinic) put together applications to renew their DACA status. 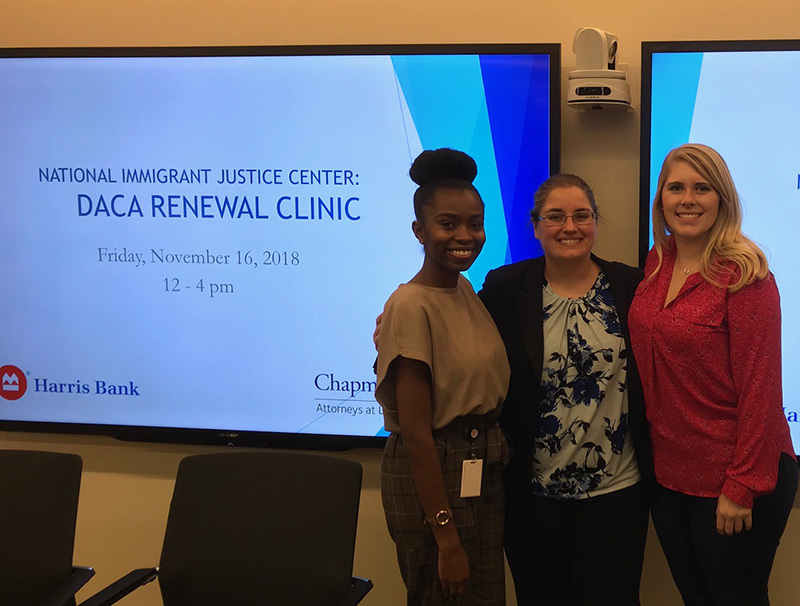 Chapman’s Pro Bono Counsel Sara Ghadiri (center) and support team members Briana Armand (left) and Rachel Waddey (right) at a DACA renewal clinic hosted at Chapman’s Chicago office.